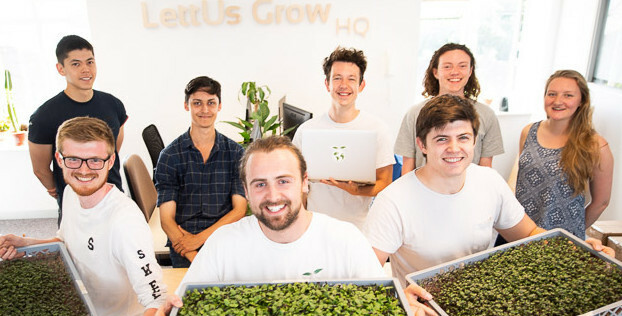 LettUs Grow, SETsquared Bristol member and creator of advanced aeroponic technology for indoor farms, announced today it has secured £1 million in funding to build world-leading indoor growing facilities, to help feed the growing global population. The UK’s innovation agency, Innovate UK, has awarded the agri-tech company a grant of £399,650 to lead a £700,000 project – which will help increase food resilience and security in the face of climate change. LettUs Grow will work alongside ECH Engineering, industry leaders in controlled environment technology, and urban agriculture experts from Grow Bristol. This is alongside a further €100,000 from the Green Challenge and several additional research grants. The grants came hot on the heels of the disruptive startup’s most recent investment round, where they raised £460,000 from ClearlySo, Bethnal Green Ventures, the University of Bristol Enterprise Fund II, managed by Parkwalk advisors, and angel investors. This funding has allowed the company to scale operations and drive forward product development to access a rapidly growing global market for efficient and sustainable farming technology. By 2050, humanity must increase food production by 70% to feed over 9 billion people. Existing methods of agriculture will not be enough to feed this burgeoning global population with 25% less farmland, degraded soil quality, and an ever more unstable climate. Alongside this, most ‘fresh’ produce is imported out of season, often travelling hundreds of miles to reach consumers and resulting in colossal waste throughout the supply chain. To help solve this problem, LettUs Grow has designed a patent-pending aeroponic system that has shown crop yield increases of over 70% compared to existing solutions for leafy greens, salads and herb production. In aeroponics, instead of using soil, plant roots are suspended in a nutrient-dense mist. This results in faster growth rates than conventional hydroponics, consistent and predictable yields, and a 95% reduction in water usage versus open-field farming. LettUs Grow doesn’t use pesticides or herbicides and massively reduces the environmental impact of delivering food from farm to fork, by siting farms in rural and urban locations. Charlie Guy, co-founder and Managing Director of LettUs Grow: “This injection of private and public funding into the company enables us to accelerate our innovative products to market and build one of the most technically advanced facilities for indoor growing in the world.